The leading manufacturer of traffic control barriers, car park controls and the famous Tiger traffic control barrier. Find security and fee generation traffic regulators and signs for traffic. 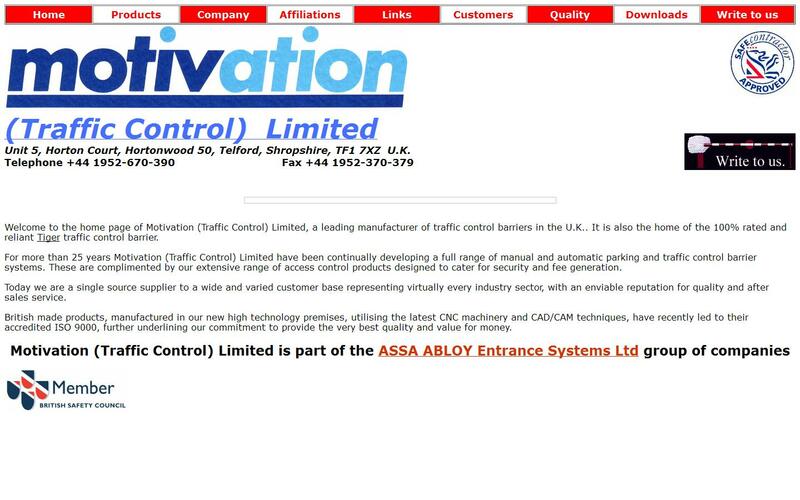 For over a decade, Motivation (Traffic Control) Limited has been continually developing a comprehensive range of access management systems.We are known as as a specialist in 100% rated and reliant Tiger traffic control barriers. We have an enviable reputation as a single source supplier to a varied and wide range of customers from virtually every industry sector. All our traffic control products such as manual and automatic parking and traffic control barrier systems are British made and are manufactured in our new high technology premises in Telford, Shropshire. We use the very latest CNC machinery and CAD / CAM techniques leading us to ISO 9000 accreditation.